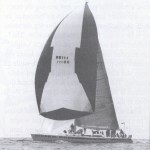 TRADER, an Andrews 70 built by AKE Ltd. in Tallinn, Estonia, won the 1993 Chicago to Mackinac, and Port Huron to Mackinac offshore races on corrected time. In the 300 mile Chicago race July 17, racers experienced mostly reaching conditions. 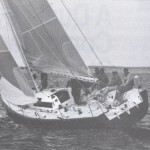 The first boat to finish was WINDQUEST, a Reichel/Pugh 70. RENEGADE, another Andrews 70 built by AKE, was 20 minutes behind, with TRADER five minutes behind her. Both WINDQUEST and RENEGADE owed TRADER an hour and ten minutes, giving TRADER the corrected time win. RENEGADE and TRADER both arrived in the United States just in time to get to Chicago to start the race, which was the first outing for both boats. Reaching and running conditions prevailed again in the Port Huron race the following weekend. The first nine boats eclipsed the old record elapsed time record, with WINDQUEST setting a new record of 26 hours, 41 minutes, and 1 second. The finish order for the first three boats was the same as it was for the Chicago race the week before. Again, TRADER was the corrected time winner. TRADER, owned by Fred Detwiler of Detroit, Mich., and RENEGADE, owned by Ken Meade, also of Detroit, were constructed with Gougeon Laminating Epoxy, unidirectional S-glass, and PVC foam. AKE wet out all of the glass fabric in the hull, deck, and interior components with a Gougeon model 892-60 impregnator. They employed vacuum bagging techniques to laminate the hulls of the boats over a male mold, and the deck of each boat into a female mold. The resulting hulls and decks were just a few pounds under designed weight. This lightness can be attributed to the accuracy of fiber/resin ratios possible with an impregnator and vacuum bagging technology. To further save weight, AKE also produced the interior components using vacuum bagged panels and shapes. Ron and Steve Sisson, of Holland, Mich. built a new boat with one goal in mind: winning the 1993 MORC International Regatta in Sandusky, Ohio. Their new yacht, ZOO III, is a Nelson/Marek 30m built at WestEase Yacht Services in Holland, Mich. The boat, completed just two weeks before the regatta, was very fast out of the box, and won that event with relative ease. In this five-race regatta, ZOO III finished first overall by 13 points, and first in class by 11.5 points. WestEase used Gougeon Laminating Epoxy [now PRO-SET® Epoxy – Ed. ], unidirectional S-glass, and PVC foam core for the boat. They wet out all of the glass with a Gougeon model 892-34 impregnator and vacuum bagged the hull, deck, and all interior components. The result was a light, stiff, high-quality boat which WestEase completed in only 16 weeks. RAGE, a new Tom Wylie 70 was first on corrected time in the semi-annual Transpac race. Built and owned by Steve Rander of Schooner Creek Boat Works, RAGE was also first to finish and second on corrected time in the Swiftsure race. Schooner Creek, in Portland, Oregon, built this ultralight sled using wood veneers over a Klegecell foam core. Longitudinal battens stiffen the hull, and all interior accommodations are bonded in to contribute strength to the hull and deck structure. They used WEST SYSTEM® epoxy products for all bonding and laminating operations on the project. Steve has been using this unusual technique for building ultralight boats for almost 15 years. AURORA, a Bill Tripp 55 built at Brooklin Boatyard in Brooklin, Maine, has been having a stellar season. This yacht has placed in nearly every regatta entered. It was second in class in the Newport to Bermuda race, and has just won IMS A (International Measurement System Class A) and IMS overall in the Fastnet Race. Unfortunately, they were disqualified for a starting line infraction. AURORA’s construction combines the advantages of some of the best technologies available. The hull is constructed of laminated veneers over a foam core, with S-glass and Kevlar skins. The deck is Divinycell foam with S-glass and Kevlar skins. The wood veneers were wet out with WEST SYSTEM epoxy, and the synthetic fiber skins were laminated with GL epoxy. Carroll Marine in Bristol, Rhode Island is producing a couple of very fast IMS racers with the Gougeon Laminating Epoxy [now PRO-SET – Ed.]. They are building the Nelson/Marek 43, and the Farr 36. Three of the Nelson/Marek 43s are now sailing, and a fourth is under construction. Twelve Farr 36s are now sailing, and several more are scheduled for construction. The Farr 36 has just been chosen as the RORC (Royal Offshore Racing Club) one design for the Admiral’s Cup, so Barry Carroll is hoping he will get orders for quite a number of them. Both of these designs are piling up very impressive race records. 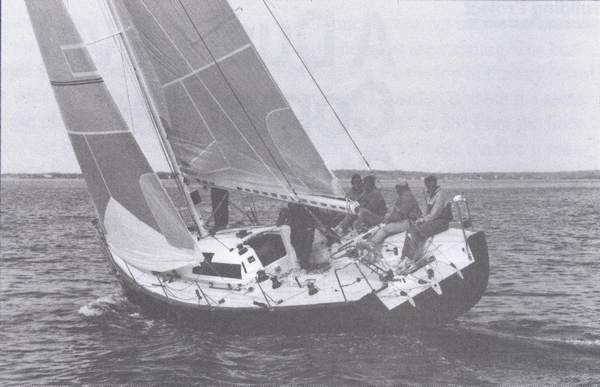 The Farr 36 PIGS IN SPACE was first in class, and second overall in the Chicago to Mackinac race. The boat, owned by David Clark of New Jersey, is traveling all over the United States, and is one of the top boats wherever he goes. He was first on handicap in the Around Long Island race, and was third in class at Block Island Race Week. C-SPRAY, a Nelson/Marek 43, performed very well in the Port Huron to Mackinac race. The boat, owned by Cheryl Cameron of Detroit, Mich., was second in class B, beating all of the IOR (International Offshore Rule) 50s on handicap. The boat seems particularly fast in light air upwind. C-SPRAY is currently leading its class on Lake St. Clair for the summer series. WIRED, hull #1 of the Nelson/Marek 43 is having a very good season as well. They won the New England PHRF (Performance Handicap Racing Federation) Championship regatta at the end of August, and have been tough to beat all season long. BULLSEYE, a N/M 43 owned by Bob Garvie of San Francisco, was first in IMS A at Long Beach Race Week in Long Beach, Calif. He too is having a winning season in local handicap racing. The hulls and decks of both the Nelson/Marek 43 and the Farr 36 are vacuum bagged laminates. The laminates are a combination of GL [now PRO-SET – Ed.] epoxy, balsa and foam cores, and E glass, or Kevlar skins. The boats are built in female molds to speed production. The long open laminating time of GL laminating resin and hardener combination allows the entire hull laminate to be done in only one laminating session for the Farr 36, and two sessions for the Nelson/Marek 43. The Gougeon 32 catamaran has continued its winning ways in multihull classes around the country. Jan and Paty Gougeon sailed their boat, POCKET ROCKET, to first-to-finish honors in the annual Lake Huron Double handed Challenge. They finished second the following weekend in the Port Huron to Alpena race on Lake Huron. Meade Gougeon, sailing his Gougeon 32 JANET C., was first to finish in the Port Huron to Alpena race. Both of these events are approximately 200 miles up Lake Huron. Jan finished third on handicap in the Buzzards Bay regatta against some of the top multihulls in the country, including several Formula 40 catamarans and trimarans. WIRED, the Nelson/Marek 43, winner of the 1993 New Englands PHRF Championship Regatta, sailing on Narragensett Bay. TRADER, an Andrews 70 build by AKE Ltd. in Tallinn, Estonia, tuning up on Lake St. Clair. This entry was posted in Boat Construction and tagged #3, AKE, AURORA, Bill Tripp 55, Bob Garvie, Brooklin Boatyard, BULLSEYE, Buzzards Bay Regatta, C-SPRAY, Carroll Marine, Cheryl Cameron, David Clark, Epoxyworks #3, Fall 1993, Farr 36, Fastnet, Formula 40, Fred Detwiler, Huron Doublehanded Challenge, Jan Gougeon, Janet C, Ken Meade, Meade Gougeon, MORC International Regatta, Nelson/Marek 43, PIGS IN SPACE, Pocket Rocket, RAGE, RENEGADE, Ron Sisson, Schooner Creek Boatworks, Steve Rander, Steve Sisson, Tom Wylie 70, TRADER, WestEase, WINDQUEST, WIRED, ZOO III on April 15, 2014 by ewadmin.